The IEEE 802.3at (PoE+) & 802.3af (PoE) compliant DPE-301GI Gigabit PoE+ Injector is designed to supply data and up to 30 watts of power to PoE-enabled devices such as network cameras and wireless access points. Deploying the DPE-301GI saves both installation costs and equipment costs, allowing a single RJ-45 Ethernet cable to carry both power and data to each device. 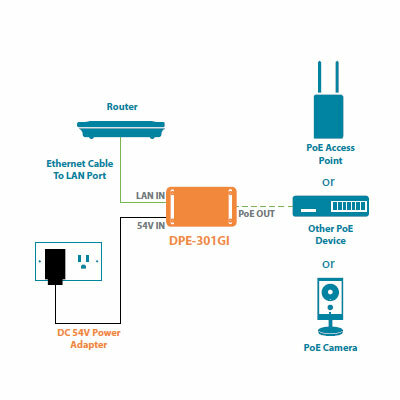 This PoE solution frees network devices from the restrictions of power availability by removing the need for a local power source. This reduces cable clutter, eliminates the need for dedicated electrical outlets in inconvenient places, and cuts down the time required for deployment. High Speed Connectivity The DPE-301GI Gigabit PoE+ Injector is designed to be deployed in situations where high bandwidth is demanded. Examples where the DPE-301GI is ideal include powering network devices such as professional network cameras with pan/tilt/zoom, night vision or internal heating/cooling features, as well as the latest wireless access points that support the high throughput 802.11ac standard.